For almost 5 years Mike Abbott worked on the beat. From patrolling some of the roughest of areas in London to arresting dozens of people for drug offences. He would be picking people up on the streets of Brixton for having Marijuana on them when he was just a young recruit. Then further on in his career as a police officer he would begin working undercover and participating in operations against some of the major drug suppliers. Then around thirty years later Abbott has become a high-flying successful businessman and its so ironic that given his background as a police officer dealing with drugs that Abbott emerged as one of the biggest legal marijuana dealers in the US. Abbott now runs Colombia Care, and he is one of the largest players to emerge in the market for medical cannabis in America. In 50 of the nations states the sale of cannabis has been permitted. 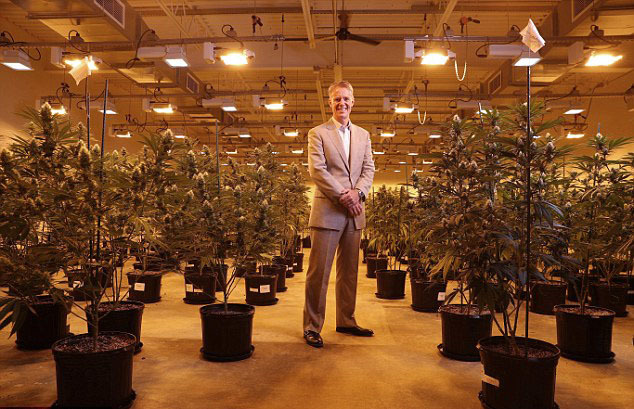 He set up his fast growing firm with one of his former colleagues from Goldman Sachs, he has gone on to open dispensaries in Arizona and some major cities like New York, Chicago and Boston. The outlets sell all kinds of things like cookies which have been created by some of the 211 staff, aswell as potent buds and specialist equipment for inhalation. All these goods would have once led to an instant arrest by the firm's boss. The supplies come from some real high-tech warehouses and greenhouses and the firm has got several thousands of cannabis plants growing in 7 states. Columbia Care is expanding really fast because of the demand for the drug which helps with all kinds of medical conditions. The firm expects to be growing more than 5 times as many plants in 2017 and will be producing around ten tons of the drop to harvest for more than 200,000 patients. Abbots firm has gathered much success during its 3 years of running and is already profitable despite them having to invest millions of pounds into the project. This just shows the vast pace of the cannabis reforms in the country thats launched and for many decades led the global war on drugs. He has been focused on the medical market and has argued that police experiences had helped to influence his unlikely change of direction, selling marijuana products to patients with conditions such as MS, Epilepsy, and cancer. Abbot is married with 3 children and he met his American wife while he was taking part in an undercover operation while watching a suspect for suspected drug activity, she was a student having a drink in the pub. He says that many of his friends thought he was a little crazy when he informed them that he was entering the cannabis industry after he had a career in top-level finance, he worked for banks and a hedge fund after he had left the police. His old pals from the days on the beat would just make jokes about pot dealing. Surprisingly he had one keep person giving the support he needs, his elderly father who was a former hospital doctor and told him that he would be able to collect data on any medical properties of cannabis then we would be doing a wider service to society. Abbots former business partner Nick Vita was the first to have heard about medical cannabis firm. he had tracked it down and was quite impressed after he had given cannabis cream to his mum who had found that it alleviated her crippling rheumatoid arthritis. The partners begun as passive investors but now they run the firm and Vita has said that hes never smoked any weed and Abbott does admit that he had tried it at uni after he had left the police. The new firm had made a few mistakes at the start, like hiring people that had grown illicit cannabis in their basements but said ‘It did not take long to realize the hippies were wrong for us,’ Today however the use academics from the Mid West to advise on farming techniques. The firm employed Tricia Reed who is their chief pharmacist at their Manhattan branch, she said she had joined the firm after she had become sick and tired of giving out highly addictive opiate painkillers which have been blamed for fueling America's heroin epidemic at a leading chemist chain. She said that she has seen many patients get off of opiates, seizures end for some children with complex epilepsy and some cancer patients have been given a fresh lease of life, and that her most memorable case was when a lady in their 30's was suffering from brain cancer, she was preparing to move into a hospice. The lady's tumor had shrunk 40% after taking cannabis and that the lady had gained weight and she was given several months extension off decent life "‘I’m not saying it’s a cure but it can improve quality of life,’ she said. These are massive claims but they do help to explain why a former London copper has decided to become perhaps the world's least likely marijuana baron. ‘Of course, we want to build a profitable business,’ says Abbott.